Many American children know about piñatas at birthday celebrations, and almost all of them know about blowing out candles, but do they know that dumping flour on the birthday child is a tradition in Jamaica? Each of the 14 double-page spreads in this informational roundup is devoted to a different country, among them Peru, Latvia, Lesotho, Cambodia, and Australia. The birthday child or a sibling describes the celebratory customs for an individual birthday or other special occasions such as Shichi-Go-San in Japan, when specific age groups (3-, 5-, and 7-year-olds) are honored. In Lesotho, where the idea of celebrating individual birthdays is not widespread, a boy describes the festivities that take place on July 17, when “our entire country celebrates the birthday of our beloved King! !” Hindu birthday celebrations in India start with a religious ceremony and continue with school parties. Klingeris, a sweet, pretzel-shaped bread, is prepared in Latvia, and the birthday child is lifted on a flower-bedecked chair. The short, simple explanations are accompanied by cheerful, stylized illustrations created with cut-paper collages and Photoshop. “Happy Birthday” in each language (in Latin script) appears in each section, with pronunciation and the original script in the glossary. 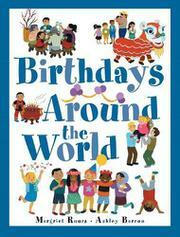 The concluding guide to extension activities mentions that links to birthday-song videos from around the world are provided on the author’s website.